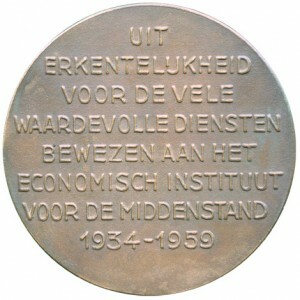 The Stichting (Foundation) Nederlands Economisch PenningKabinet was created on 15 June 1961 by dr. W.L. (Willem Lyckele) Groeneveld Meijer, former director of the Economic Institute for Retail (Economisch Instituut voor de Middenstand). The basis of the collection was formed by the over 250 medals that Groeneveld Meijer had collected during his active carreer. Groeneveld Meijer started his studies at the Nederlandsche HandelsHoogeschool (NHH) in Rotterdam in 1915. In 1921 he receeived his degree, and already in 1924 he successfully defended his doctorate thesis. 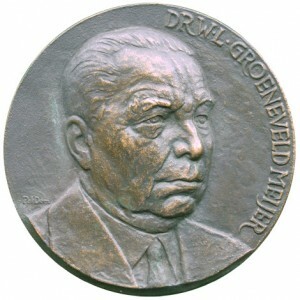 In 1963, Groeneveld Meijer entrusted the Stichting NEPK and the collection to the Nederlandse Economische Hogeschool (NEH), since 1939 the successor of NHH. In 1973, NEH itself was merged with the Medische Faculteit Rotterdam to form Erasmus Universiteit Rotterdam. “bringing together, acquiring, extending end maintaining a collection of (Dutch) medals, in particular those from 1900 onwards which are associated with an economic activity”. For practical reasons, in 1993 the Stichting NEPK was merged with the Foundation SUHK (Stichting Universitair Historisch Kabinet).